My own sort of trackback. Thanks for writing about John Denver.. I never knew he got snubbed, being that was born in 1983. Anyways, you're correct, he should have been there. I too liked the name and song Darcy Farrow. In fact I loved it so much that I got permission from Steve gillete and tom campbell who wrote the song to write four novels based on the song darcy farrow. the first book "Remembrance" will be out this year 2007. my website is www.darcyfarrow.com the site will be updated this january. please take care give me an email sometime. He should have been there. I read a couple of biographies on John Denver, and I have to say I was amazed at all the time and effort he put into so many worthy causes. I think it was a disgrace that he was not asked to be in the "we are the world." What makes John Denver's death to this day difficult is the power of his music and how his vision and his lyrics are very relevant today regardless of whether you believe in global warming or not. I didn't know until I was reading the Wiki on "We Are the World" that John was snubbed and you're right, he was "out" there and made such a huge impact on countries like Russian, China and the continent of Africa and here we are 11 years later admiring such an incredibly gifted human being. John Denver's efforts on behalf of the environment, to relieve world hunger and to spread tolerance and compassion come straight from the heart of a man who was truly ahead of his time. We need his beautiful music and his vital message now more than ever. It was truly a tragedy to have lost him so soon. There are many songs and videos of him on YouTube. Search him out if you need a lift today. Thanks for one's marvelous posting! I genuinely enjoyed reading it, you can be a great author.I will be sure to bookmark your blog and will often come back sometime soon. I want to encourage continue your great job, have a nice holiday weekend! Thanks for your marvelous posting! I seriously enjoyed reading it, you might be a great author.I will make sure to bookmark your blog and may come back later in life. I want to encourage yourself to continue your great work, have a nice holiday weekend! What a kind man and devoted to what he believed in. How dare he not be included in a "pop" song and video that would never have been made without his influence. In fact, his concern was the main reason his popularity declined in the late 70's and early 80's. Shame on you Quincy Jones and Lionel Ritchie and everone else who thought they were too gifted to sing with John...that's why we're still talking about him almost 14 years after his death. FAR OUT! Here it is now 2016 and I still listen to his music every day. I really believe he was a prophet during his time. We will all be sorry we ignored him. I also think it is an outrageous mistake those people made by declining our beloved John Denver's offer to participate in that musical event. However, this is all just crying over spilled milk. It just did not happen. John Denver will still be remembered with or without having been part of 'USA for Africa'. 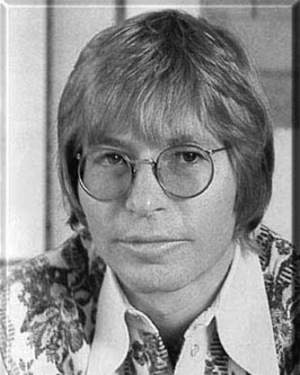 John Denver has been, and will always be my favorite musician, no matter what. Thanks a lot for bringing him to my mind once again. Now 2018 and John Denver is still my favourite singer, His songs his nature everything about him says look after your world and the people who live init. Everything in nature he loved and was never afraid to show that compassion. Shame on all those who excluded him from Usa for Africa.